A top five is a good night for the points. Unfortunately for Hossfeld though, the two drivers that he is chasing in the standings finished first and second. Hossfeld isn’t going to let that bother him though. It’s been a tough summer for Eddie Flemke. After his #10 Gary Teto-owned team showed great promise with a third-place run at Jennerstown, they’ve struggled with no top 15 finishes in the past four events. That slide came to a halt at Stafford. Flemke was strong all race and finished seventh. With Thompson, a place where Flemke sure knows how to get around, up next even better things might be on the horizon for the tight-knit team. Donny Lia hopped into the #47 Wisk/Snuggle SK Modified at Stafford with high hopes to start off the season. Just a few races in, the team destroyed their first car in a practice wreck. They built a replacement, but getting that car up to speed has been a bit of a challenge. The caution which Hirschman refers to is one came out on lap 114. It led to everyone on the lead lap to come in and pit. After it rained, Hirschman also drove away from them and right into victory lane for the third time this season. Chuck Hossfeld led the first 29 laps at Stafford and stayed around the lead pack until the lead lap cars made their pit stops with less than 40 laps to go. Having such a short run to the finish leaves no room for problems during a pit stop. Hossfeld found that out the hard way. as we started, but the car started to come around. I started to catch Teddy and the #48 [Tony Hirschman], but then we had the caution and it got tight again. It took just about until the checkered flag for the car to do what I wanted it to do. We needed a couple laps. One finishing position ahead of Marquis, there wasn't much joy. Ted Christopher might be leading the standings on the NASCAR Whelen Modified Tour, but he’s certainly not points racing. Asked if he was happy with a strong second place run at Stafford, TC had a short and to the point reply. Mike Stefanik might have had the fastest racecar during the New England Dodge Dealers 150, but he was forced to settle for fourth place at the finish. Stefanik got caught behind a tow truck on pit road during his pit stop and lost the lead on that exchange. When he came out, he hunted down the cars that he could but simply ran out of time. At Stafford, John Blewett once again had a strong run. In that respect, it wasn’t any different than his recent races at Beech Ridge, Seekonk or Riverhead. In all of those events, he’s been fast. He hasn’t always had the best of luck, but he’s been fast. Those starts all came in Joe Brady’s #00. 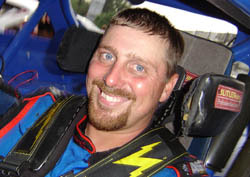 At Stafford, Blewett finished eighth in his own #66 car. He raced with a pit crew that included cast members from all directions of the garage area. “I’m proud of these guys,” said Blewett. “This is the first race this year really with everyone together. It’s kid of a ragtag deal. I’ve got a few guys from Sheba Racing, I’ve got a few guys of my own. I’ve got a guy from Donny Lia’s crew and Curt Chase’s crew. It’s our first time together as a group and they worked together really well. I’m proud of them. We only lost one spot in the pits and that was to a car that changed fewer tires than we did. With that string that he’s put together, Hirschman is only 14 points behind the current championship leader, Ted Christopher. Winning at Stafford definitely helped his cause. Hirschman set fast time at Stafford, but did not have a standout car in the early laps of the race. Blewett had a fast car, but was limited with what he could do in traffic. Still, the night wasn’t a total loss for Hossfeld. He passed his way back into the top five. 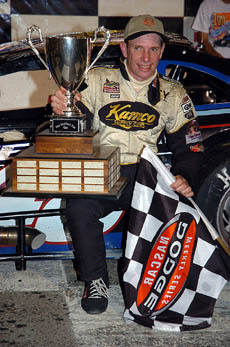 In the last six races on the NASCAR Whelen Modified Tour, Tony Hirschman has finished first or second five times. His “bad” race during that period was a fourth at Seekonk. Stafford was the second race that Stefanik has driven this year in the #16 Eric Sanderson-owned car and in both events, he has been fast. but it looks like it might log a few more this week at Thompson Speedway. So what are Blewett’s plans beyond this week’s race? 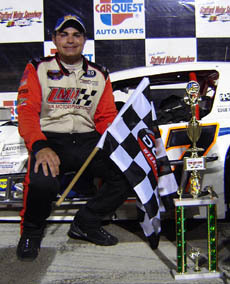 Last season, Jerry Marquis won a race at Stafford. This year, his luck at the track has left something to be desired. 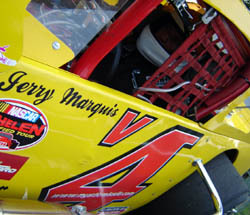 His #4 car been a magnet for getting drawn into wrecks during the first two events of the year there and finishes of 27th and 26th were not what the veteran was used to at the Connecticut short track. Things turned around this time out though with a third-place finish and not one crumpled body panel. The pit stop that Marquis refers to helped the team gain valuable track position near the end. An even better result could have been possible if not for a late race rain delay. Lately though, Lia has been ratcheting up his finishes at Stafford. He took the biggest step forward Friday night by winning his first SK race. To win at Stafford is a big deal for Lia both personally and professionally. “This place is so tricky. Turns one and two are probably two of the hardest corners anywhere that we race. You don’t know where to be coming off the corner. Those turns can bite you. If you are a little too tight or a little too loose, you’re done. So to get it right means that you figured this place out. That feels good. “There’s been a lot of hard work and dedication. We’ve had some heartache and a lot of downs, but not a lot of ups. I’ve got a real great group of guys behind me and they just don’t give up. I’m thankful for the opportunity that they’ve given me. The win at Stafford almost didn’t happen though. Early in the race, it looked like the team’s bad luck would continue when a big wreck took place directly in front of Lia. Dust and smoke blanketed the frontstretch. Somehow, the white #47 drove out of the mess without a scratch. Despite missing a race because of that practice crash, the #47 team has moved up to fourth in the Stafford points, only two markers behind defending champion Ted Christopher. More importantly, they are enjoying themselves. Before the SK feature, Lia finished ninth in the Tour event. The finish helped to keep Lia in the top five of the Tour point standings, but isn’t exactly what he wanted either.